Enter now to win an all-expenses-paid trip to California! Calling all G.I.R.L. (Go-getter, Innovator, Risk-taker, Leader)™ entrepreneur superstars participating in the 2018-2019 Girl Scout Cookie Program—the largest girl-led entrepreneurial program in the world! We know you’re out there shining bright like Girl Scouts do—working hard, taking the lead, crushing your goals, learning so many new skills, and changing the world all cookie season long. And we want to hear from you. Enter the 2019 Cookie Pro™ contest today by sharing your unique cookie story for a chance to head to sunny California and meet the DC Super Hero Girls™, who—just like Girl Scouts—are motivated, resilient, and determined to succeed! That’s right. Girl Scouts and the similarly self-starting, passionate, and creative DC Super Hero Girls™ have teamed up to help young cookie entrepreneurs across the country unleash that unstoppable G.I.R.L. shine, share their cookie stories with the world like super heroes, and enter for a chance to win an epic adventure they’ll never forget! All you have to do to enter is participate in the Girl Scout Cookie Program this season and highlight your tale of skill and strength by 1) answering questions about your entrepreneur experience and the skills you learned, and 2) creating your very own cookie story—fun! Use our handy tip sheet and template to prepare your entry, and come back when you’re ready to submit it! Please note that a one-page story is required if you’re a Daisy, Brownie, or Junior, and a two-page one is required if you’re a Cadette, Senior, or Ambassador. If you’re a Daisy, Brownie, or Junior, you can still submit two pages, but you will not earn extra points for submitting an additional page. I have a photo of my cookie story ready to upload. I have a solo photo of myself (from the waist up) ready to upload in which my face is clear and in focus. Ready to go? Awesome! It's time to put that I-can-do-anything super hero cape in motion and shine bright like a Girl Scout by completing your Cookie Pro entry. Good luck! Nearing the end of your cookie sale? Answer extra credit questions to show us how you rocked your sale this season. We encourage you to answer these questions as you’re approaching the end of your sale to highlight all of the amazing things you accomplished this season. The extra credit questions will be available here during the promotional period (January 2—April 30) and will provide all entrants an opportunity to earn extra points towards their submission. Please confirm you have completed the required questions to continue (extra credit link will appear when box confirming completion of main entry is checked). I have completed the required questions on my Cookie Pro entry. Girl Scouts-Arizona Cactus-Pine Council, Inc. Girl Scouts Carolinas Peaks to Piedmont, Inc. Girl Scouts of the Chesapeake Bay Council, Inc. Girl Scouts of Citrus Council, Inc. Girl Scout Commonwealth Council of Virginia, Inc. Girl Scouts of Eastern Iowa and Western Illinois, Inc. Girl Scouts of Eastern Missouri, Inc. Girl Scouts of Gateway Council, Inc. Girl Scouts of Greater Atlanta, Inc. Girl Scouts Heart of the Hudson, Inc. Girl Scouts of the Jersey Shore, Inc. Girl Scouts of Kentuckiana, Inc. Girl Scouts of Kentucky's Wilderness Road Council, Inc. Girl Scouts of Maine, Inc. Girl Scouts of Middle Tennessee, Inc. Girl Scouts of South Carolina-Mountains to Midlands, Inc. Girl Scouts of Northeast Kansas and Northwest Missouri, Inc. Girl Scouts of Northeastern New York, Inc. Girl Scouts of Northern Indiana-Michiana, Inc. Girl Scouts of NYPENN Pathways, Inc. Girl Scouts of Oregon and Southwest Washington, Inc.
Silver Sage Girl Scout Council, Inc. Girl Scouts of Southeast Florida, Inc. Girl Scouts of Southeastern New England, Inc. Girl Scout Council of the Southern Appalachians, Inc. Girl Scouts of Southern Nevada, Inc. Girl Scouts of Southwest Indiana, Inc. Girl Scout Council of Tropical Florida, Inc. Girl Scouts - Western Oklahoma, Inc. 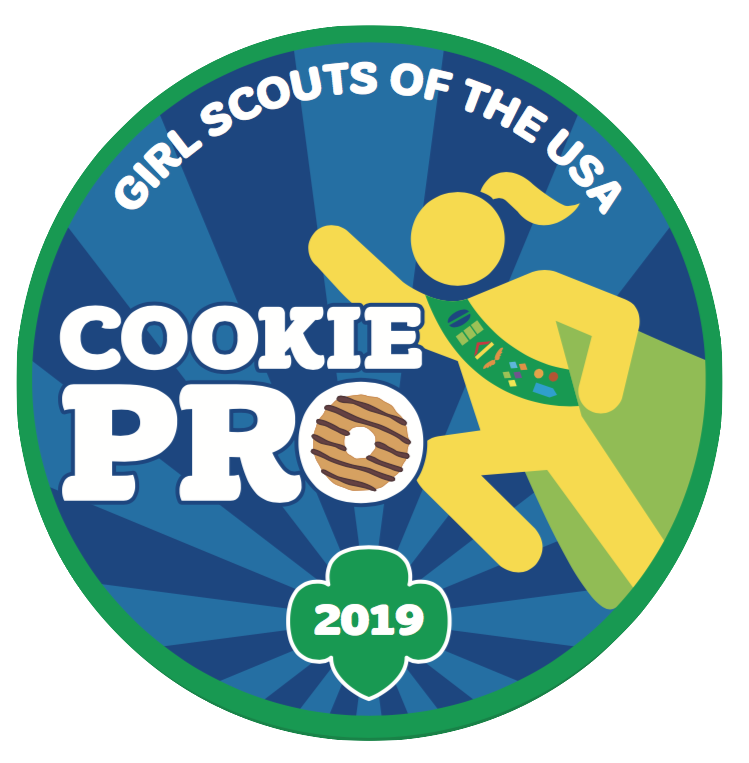 Girl Scouts of Wisconsin - Badgerland Council, Inc.
Every cookie entrepreneur who enters GSUSA's Cookie Pro Contest 2019 will receive instructions by email on how to unlock this awesome, limited-edition Cookie Pro 2019 patch for optional purchase—rock it with pride, girls! Entries accepted January 2-April 30, 2019. Questions? Check the official contest rules and FAQs, or contact your local Girl Scout council. You can also reach us via email if you have questions about your Cookie Pro 2019 patch purchase. DC SUPER HERO GIRLS and all related characters and elements © & ™ DC Comics and Warner Bros. Entertainment Inc. WB SHIELD: TM & © WBEI (S18). The Girl Scouts® name, mark, and all associated trademarks and logotypes, including the Trefoil Design, G.I.R.L. (Go-getter, Innovator, Risk-taker, Leader)™, and Cookie Pro™ are owned by Girl Scouts of the USA. The Cookie Pro Patch design is for use on marketing collateral only. The patch image may not be reproduced on any merchandise or product for give away or for sale. To enter the Cookie Pro contest, girls must be a registered Girl Scout participating in the 2018-2019 Girl Scout Cookie Program, and legal residents of one of the 50 U.S. states, the District of Columbia, Guam, or Puerto Rico, including Residents currently residing in overseas military installations with a valid APO/FPO mailing address.